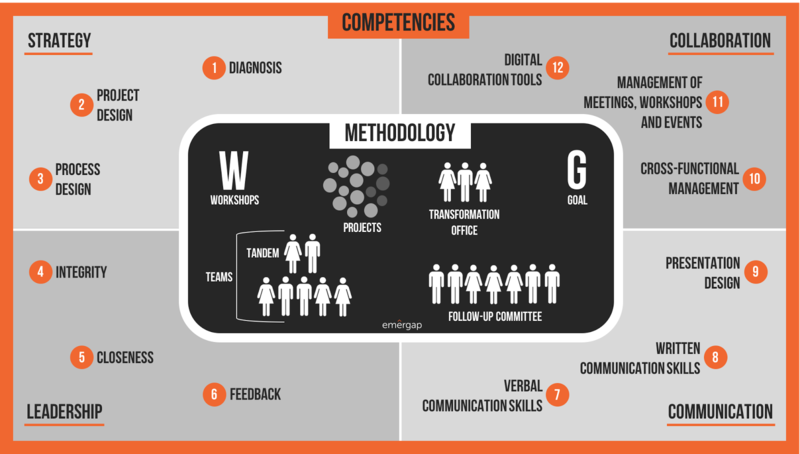 emergap is a consulting firm specialised in transformation. to develop new competencies within the organisation. DIAGNOSIS | Based on interviews with the CEO, directors and middle management, as well as a study of internal documentation, we diagnose the situation within the company in strategic, organisational and cultural terms. We also define the degree in which the company requires ongoing consulting services. METHODOLOGY | We design the transformation approach, adapting it to the structure, strategic goals and culture of each organisation. FACILITATION | We facilitate the process within the company by working alongside the CEO and the management team. We also offer them feedback regarding their leadership of the process. FOLLOW-UP | We ensure implementation of the transformation projects with a disciplined follow-up procedure based on a simple model of indicators and featuring a collaborative work platform that provides constant visibility for the progress that is made. COMPETENCIES | We work with the teams leading the projects so that they develop the new skills required by the organisation. Experience in top-management programmes at business schools. Research and publications on transformation and innovation. Experience in implementing consulting projects.